This pumpkin rice krispy treat pie is a delicious alternative to the traditional Thanksgiving dessert and it’s easy to make too! Pumpkin…the mascot of October and the pie of choice for November. But, I have a confession to make. I hate pumpkin pie. Loathe. Maybe that’s a better word. I’ve tried to choke down a bite every single Thanksgiving and regardless, my taste buds reject it every time. I don’t get it. I like pumpkin chocolate chip cookies, pumpkin spice lattes, and anything else that the stores stock on the shelves during the month of October…but pumpkin pie? Noooope. Can’t. Do. It. I know I’m in a segregated group of weirdo’s, but alas, here I am. Pumpkin pie-less. Until today! From what I’ve read around the web, I’m not the only one intimidated by the thought of making my own marshmallows. I don’t know what it is about those pillowey little clouds of sugar, but they are intimidating AF. (Don’t you guys agree?!) I’ve attempted them once before, only to throw the whole batch in the trash, but my stubbornness won out and I gave them another shot. And, boooooy, am I glad that I did! Not only are they actually really easy to make when you get the concept down, but they are sooooo much better than store bought mallows. 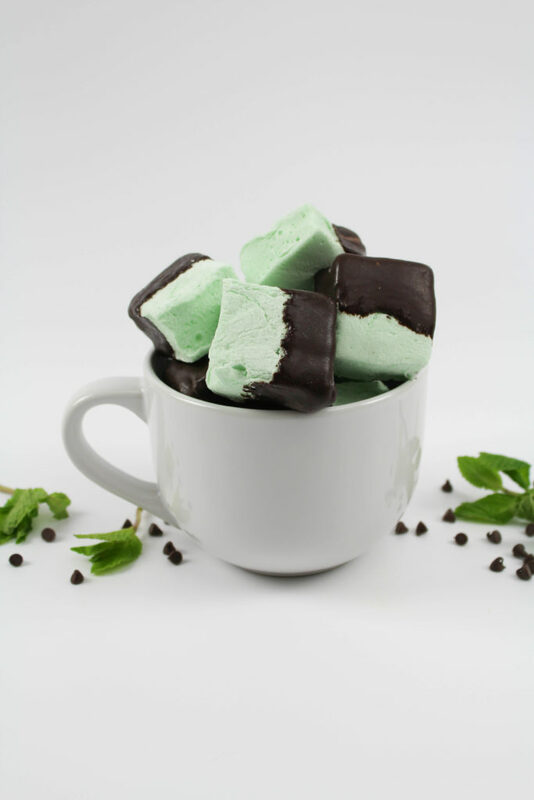 I’m not even a marshmallow girl, but I’d definitely snack on a few of these mint chocolate marshmallows!